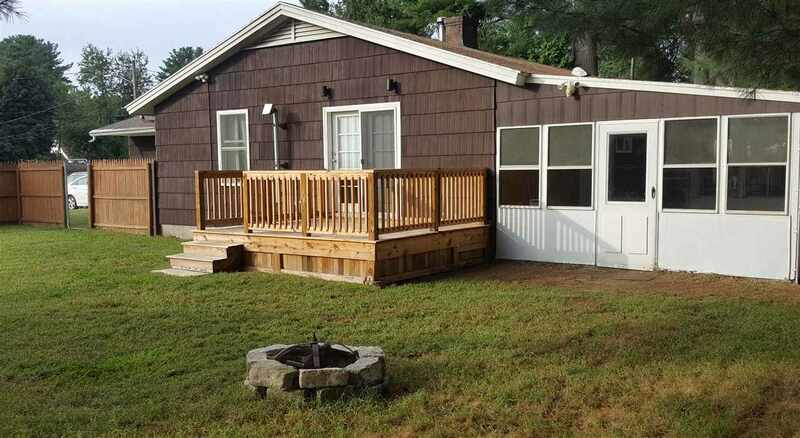 Well-Located 2/3 Bedroom Family Home in Desirable Goffstown, NH!! This solid, well-built property features 2/3 bedrooms and 1 bathroom with 1,356 sq ft of living space on the main level. The potential 3rd bedroom is currently being used as an office. The kitchen has granite countertops and stainless steel appliances. There&apos;s hardwood flooring throughout the upper level with a ceramic tile floor in the kitchen and a porcelain tiled bathroom. There&apos;s also a 14 x 16 finished three-season porch and a 10 x 12 deck; both located off the kitchen with their own access doors. This home also has a 20 x 24 finished lower level bonus room (another potential bedroom!) with a wood stove hookup and LOTS of storage. The home has freshly painted rooms and some newer windows throughout. The property is fenced in with a 10 x 12 shed that has electricity and a loft for even more storage space! Off-street parking (enough for 4 vehicles) is available along with a one car garage that has additional storage space. 2018 updates include a new Weil-McLain boiler and a new roof with architectural shingles. This home is generator ready and has three sources of heat: oil, wood pellet stove and wood stove hook-up. Selling Office: Century 21 Circa 72 Inc.